Do you want to inject some gorgeous greenery into your home (in time for St. Patrick’s Day) without the unnecessary headache? You certainly can by using low-maintenance indoor plants! Plants can instantly uplift the mood of your home, reduce stress, and improve the quality of your air all at the same time. However, some shun the idea of incorporating plants into their living space because, well, they need a lot of TLC, and many have had bad experiences with it. Not all plants need to be babied thoroughly, though. Below are some houseplants that are a breeze to keep – whether you are born with a green thumb or not! Snake plant is also known as Mother-In-Law’s Tongue and St. George’s Sword. If you’re looking for a decorative indoor plant that just doesn’t beautify your home but provide health benefits as well, this is the one for you. It purifies the air in your home by converting carbon dioxide into large amounts of oxygen at night. Cost-wise, it’s one of the best. 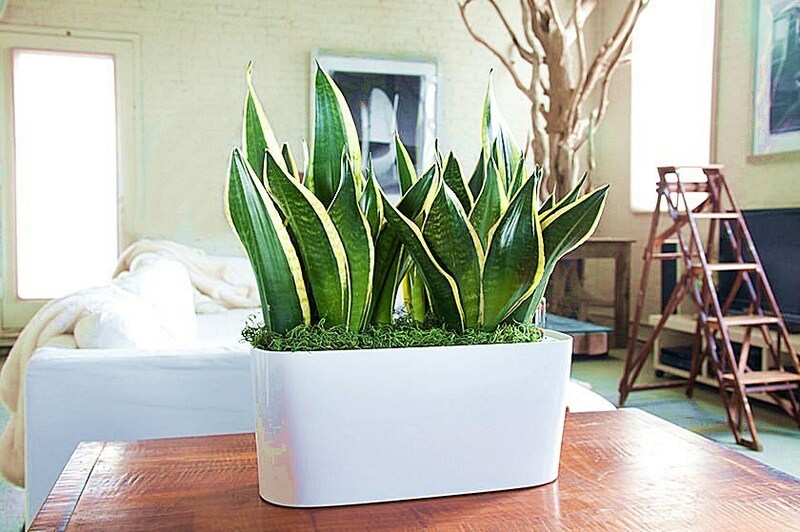 The snake plant requires moderate care (in fact, overwatering will make it rot) and it’s practically imperishable. Just like the Snake Plant, the Cast-Iron plant is pretty much tough to kill. It can grow under low light, can tolerate a very humid environment, and will not wilt away and die even if you forget to give it attention. Another reason to give this genus a go is their slow growing ability. You won’t have that fear of your living room looking like a forest in a month. ovate Its coin-shaped, succulent leaves afforded it the name “The Money Plant”. Yes, its attractiveness factor is a real deal-sealer, but the jade plant’s longevity and resilience makes it a superb houseplant! Too lazy to water your plants? No problem! It can withstand neglect. In fact, you only need to water your jade plant once a month. Other than being a nice accessory to your abode, jade plants are known to have health benefits, too. In folk medicine, it’s used as a treatment for warts and nausea. We're sold! Another succulent plant that’s perfect for busy people is the Flapjack. They are very easy to grow and they last for a long time. They are equipped with internal storage located in its tissues that hold water, so even if you forget to water it for a couple of days, it will be just fine. Although the flapjack naturally craves direct sunlight, it will not have a problem adapting to minimal light. The Peace Lily got the much needed respect it deserves when NASA and the Associated Landscape Contractors of America included it in the list of 'Top Ten Household Air Cleaning Plants'. Based on their study, the Peace Lily can remove toxic chemicals in the air by absorbing them. It can tolerate being uncared for and will even give you a signal when it needs to be watered! Once the leaves and the bloom slightly sags, water the plant generously. You only need to do this once a week. You can keep it hydrated by during hot months by spritzing the leaves with water every couple of days. Aside from the Peace Lily, the ZZ Plant is another low-maintenance plant from the Araceae family that’s great for indoors. Its beautiful leaves make it a stunning addition to just about any interior. You can keep it happy by not allowing it to sit in direct sunlight and by not watering it too often.